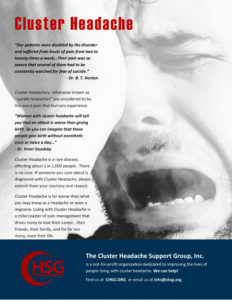 Cluster headache (CH) comprises the most frequent trigeminal-autonomic headache syndrome and has a mean prevalence of 0,1% . The designation highlights its typical pattern, in which each attack (a single episode of headache) occurs in clusters or bouts of variable duration, with a circadian and circannual rhythmicity [1, 2]. The term “cluster-tic syndrome” is used for the rare ipsilateral co-occurrence of attacks of cluster headache and trigeminal neuralgia. Medical treatment should combine treatment for cluster headache and trigeminal neuralgia, but is very often unsatisfactory. Migraine is a highly disabling neurological pain disorder in which management is frequently problematic. Most abortive and preventative treatments employed are classically non-specific, and their efficacy and safety and tolerability are often unsatisfactory. Mechanism-based therapies are, therefore, needed. Calcitonin gene-related peptide (CGRP) is recognized as crucial in the pathophysiology of migraine, and new compounds that target the peptide have been increasingly explored in recent years. First tested were CGRP receptor antagonists; they proved effective in acute migraine treatment in several trials, but were discontinued due to liver toxicity in long-term administration.